The problem with pedaling 115 miles one day is that it wipes me out for the next. When I opened my eyes, after seven, everything ached. I got myself upright and stretched, but I was moving slow. 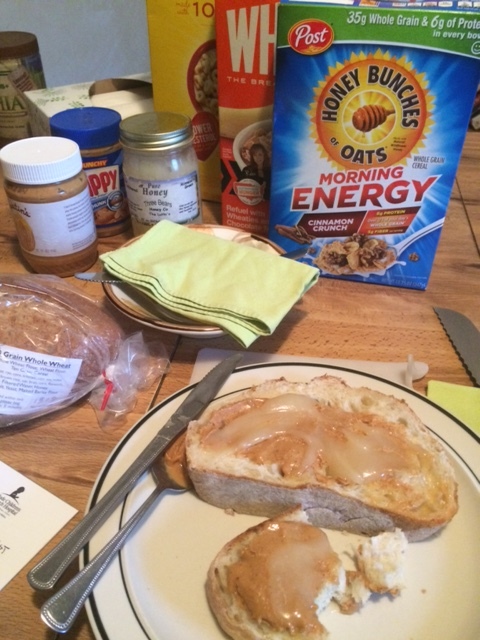 My host, Jen, had a 4 a.m. bakery shift, but Jen’s so sweet that while I slept she’d bought my bike indoors to stay dry through last night’s thunderstorms, and left me a generous breakfast. There seems no bottom to the kindness of warmshowers hosts. I enjoyed my breakfast, oiled my chain, loosened my bones, and stopped by Jen’s workplace to thank her and say goodbye. It was nine when I cycled out of town, a very late start. I was sluggish for the first five; make that ten, no make that twenty miles. Intermittent rain, rolling hills, and a hefty headwind compounded my fatigue. I took a Diet Coke break; the caffeine put me in gear. Complete fog replaced the rain. 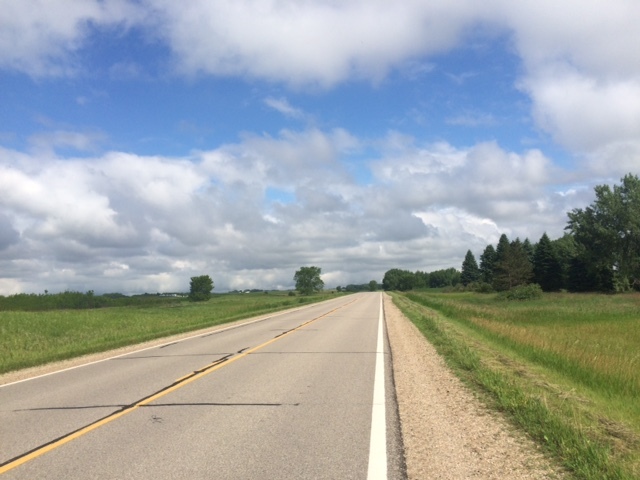 There was no traffic on old highway 52; I was the only moving thing, though the wind made sure I didn’t move fast. After another energy bar and diet coke break, my highway was barricaded and the detour sign arrowed me backwards. I hate going backwards. I peered down the closed road; it appeared paved but not striped. I decided to gamble that it was passable and I wouldn’t be caught on a somnolent Saturday. My hunch was rewarded with six miles of the smoothest pavement and nary an oncoming vehicle. The wind still taunted me, but the land turned flat and I was doing okay. By three, the sun was shining. I rolled into Moorhead and stopped at Walgreen’s for provisions. By four I entered the King China Buffet in downtown Fargo for a long overdue lunch / early dinner. North Dakota. Months ago, when some asked me what I was most looking forward to on my trip, I replied, “North Dakota.” I’ve never been here, but I love tall grasses and broad horizons and feeling like no one on the face of the earth knows where I am. All attributes I bestow upon this rugged state. Yet as I arrive, I’m filled with apprehension, which contributes to the hard cycling I’ve had the last two days. My mind is distracted. 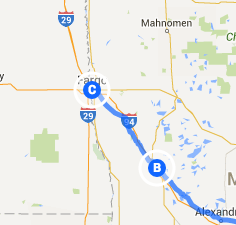 Tomorrow, when I pass beyond Fargo city limits, so much about my trip will change. It’s exciting, but also scary. North Dakota requires a level of strategy places East don’t demand. I have no warmshowers hosts in North Dakota. For seven nights, at least, I’ll stay in motels, all booked in advance, many spaced at challenging distances from each other with few if any services between. My preferred rhythm of riding 50 to 60 miles and then meeting with people in the afternoon is impossible here. I will have 90 to 100 mile days, followed by rest days. If the weather is kind and winds are good, I’ll be able to handle the distances. But they are both notoriously fickle here. I’ve already modified my route. For years, bicyclists traversed U.S.2, and I planned to follow that road to Minot and Williston, the heart of the oil and gas boom. However, the boom related truck traffic on U.S.2 is so strong cyclists have been advised to stay away, so I pulled my route south accordingly. 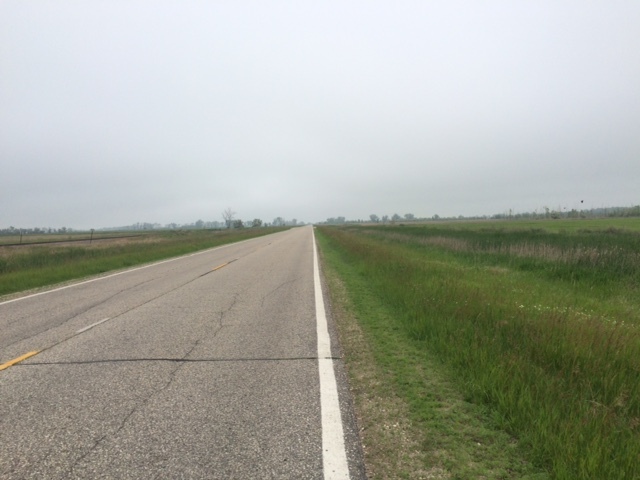 North Dakota actually allows bicycles in Interstate 94, which may not be pleasant but at least the road has wide shoulders. I’m also traveling heavier. Instead of two water bottles, I’ll carry five, plus more food than usual. When I tackle my 90 miles to Cooperstown tomorrow I’ll tote enough to go the distance. One advantage – I’ll have plenty of daylight. I’m going to my northernmost destination on the longest day of the year. All this worry washed away with plate upon pate of fresh vegetables, egg rolls, chicken in sticky sauces, puff pastries, almond cookies, vanilla pudding and ice cream. Chinese buffets lose money when I walk in the door. 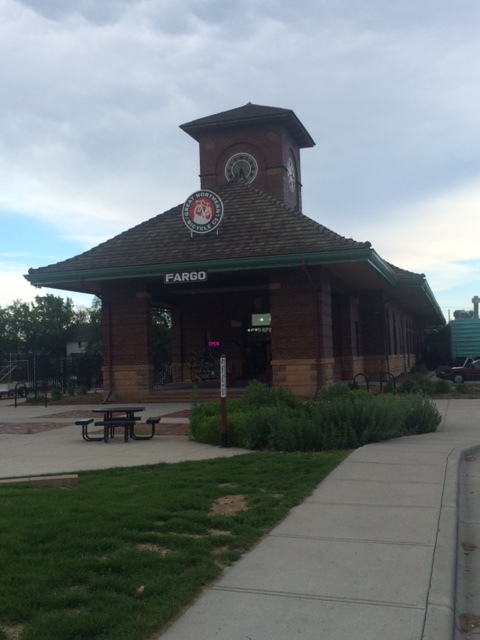 I left around six, wandered Fargo’s funky downtown, got some bike accessories at Great Northern Bike Shop, located in the former railroad terminal, and then pedaled over to the Fargo Red Hawks Minor League baseball game. 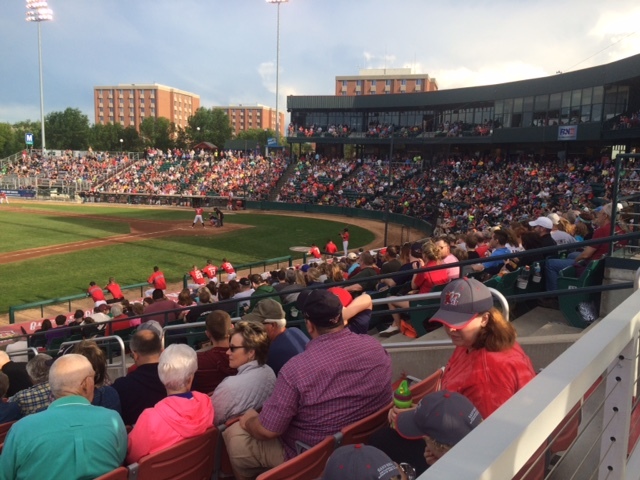 It was a perfect night for baseball, and the Red Hawks have a good following. 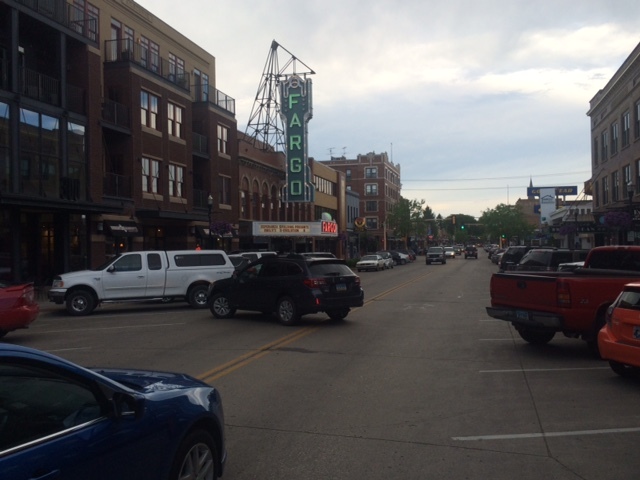 Everyone I talked to in Fargo, except the two old-time loiterers on the park bench in front of China King, is bullish on Fargo. Unemployment under 3%, 11,000 vacant jobs ready to be snatched, $600 signing bonus advertised to work in a restaurant, and a population projected to grow by more than 50% in ten years over the next ten years. 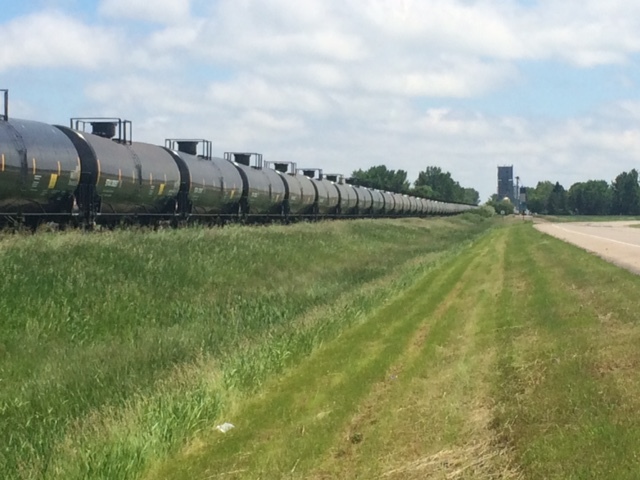 The passenger train station may have been turned into a bike shop, but the long oil-car trains that rumble through town on a Saturday afternoon whistle that in North Dakota, they’re pumping money.